It once was organized but still not functional. I had access to only two-thirds of the cutting table because of the way that it was turned and the items I had stored underneath were pretty much out of reach. Well my sweetie put up a couple of shelves for me today. I did a little rearranging… then put up a couple of design walls. So many of you have posted pictures of your gardens and it has me looking forward to the day I will have time to plant my own. We love fresh fruits and vegetables but have to rely on our local farmer's markets and produce stands to provide the bounty. The cranberry walnut bread is absolutely fantastic! I also made some progress on Doreen's Jelly Roll quilt along but not near enough and I didn't even touch my DD's graduation quilt. It seems that I've set unattainable goals for myself. Between my full-time job and household duties I simply do not have enough time to keep up with a UFO / stashbuster quilt along, a new seasonal quilt, my DD's gift AND knitting for the soldiers. So, my new plan is to finish Doreen's project, catch up and keep up with Deck-Ade the Halls and not start anything new until the graduation gift is finished. My DD's quilt is very important and must be as close to perfect as I can possibly make it. 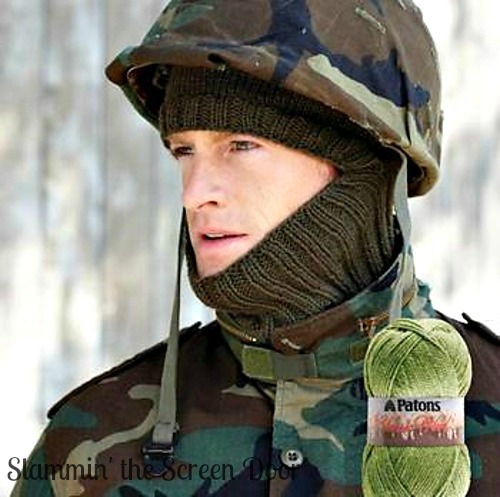 Since I can knit on the commute to and from work, I'll still be able to work on the helmet liners. This project is also very important to me. This adventure is still very new and it will take me some time to figure out a schedule that works. 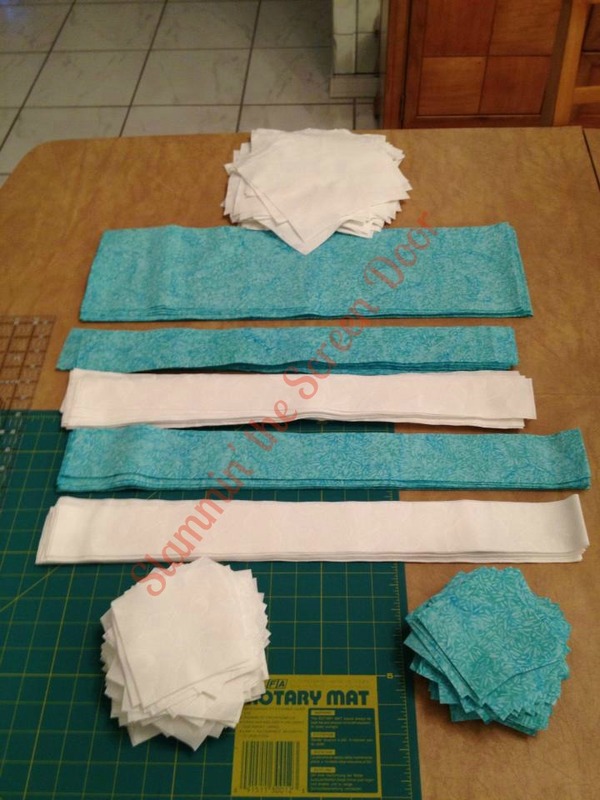 For now, I am enjoying my time at the sewing machine and keeping up with YOU, my friends in blogland. Noooo…. No wedding, just an outline of what has been going on around here. Sounds like it could be a lot but I feel like I’ve been spinning my wheels. 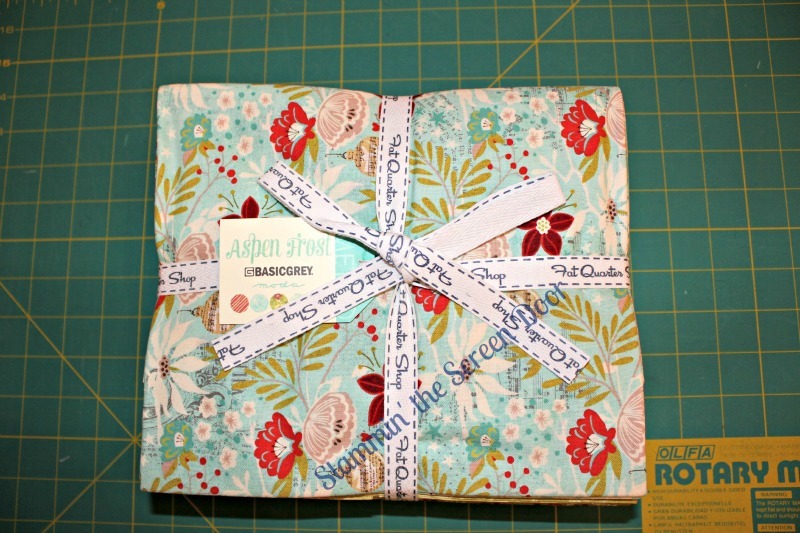 Something Old – Stash buster project. 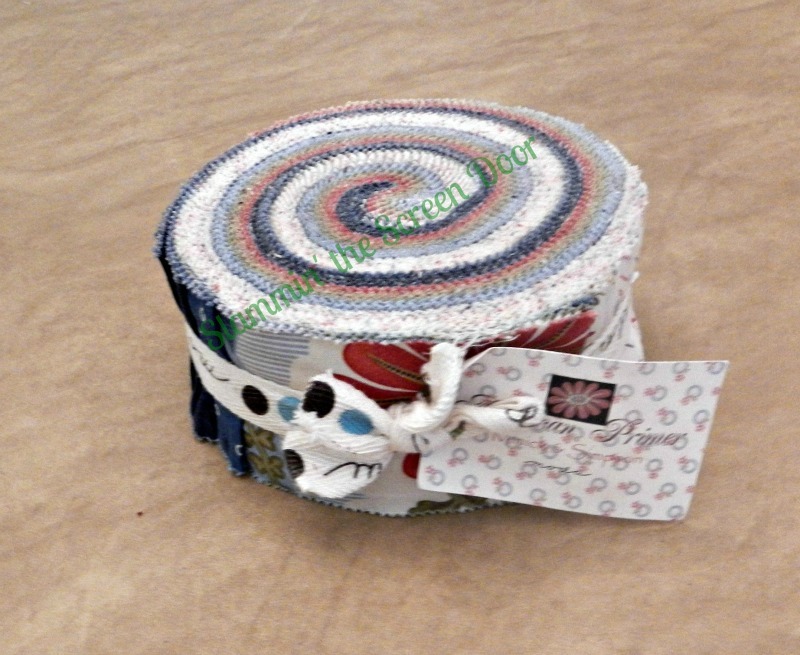 I’ve joined Aunt Reen’s Jelly Roll Sew Along. The jelly roll I chose is American Primer by Minick & Simpson for Moda (now that’s OLD). I still need to choose background fabric and get started…yes I’m two weeks behind on this one. 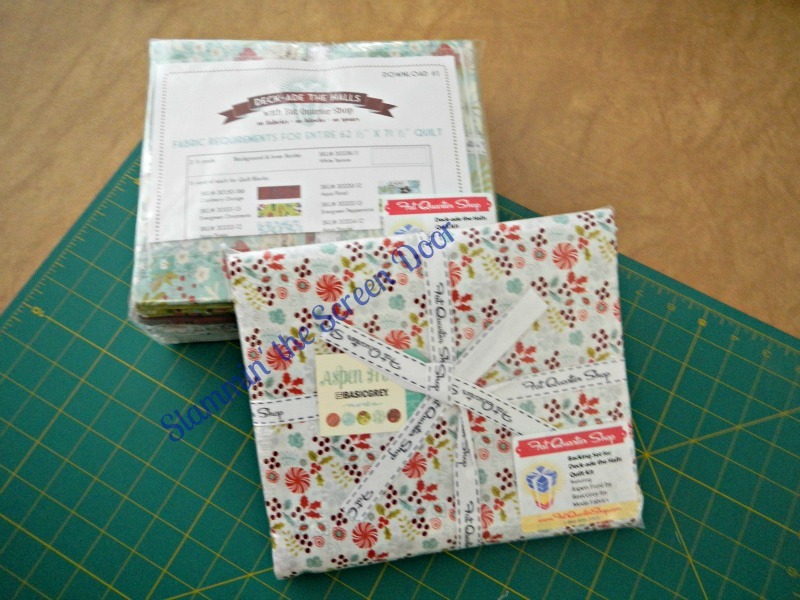 Something New – Fat Quarter Shop’s Jolly Jabber: Deck-Ade the Halls. 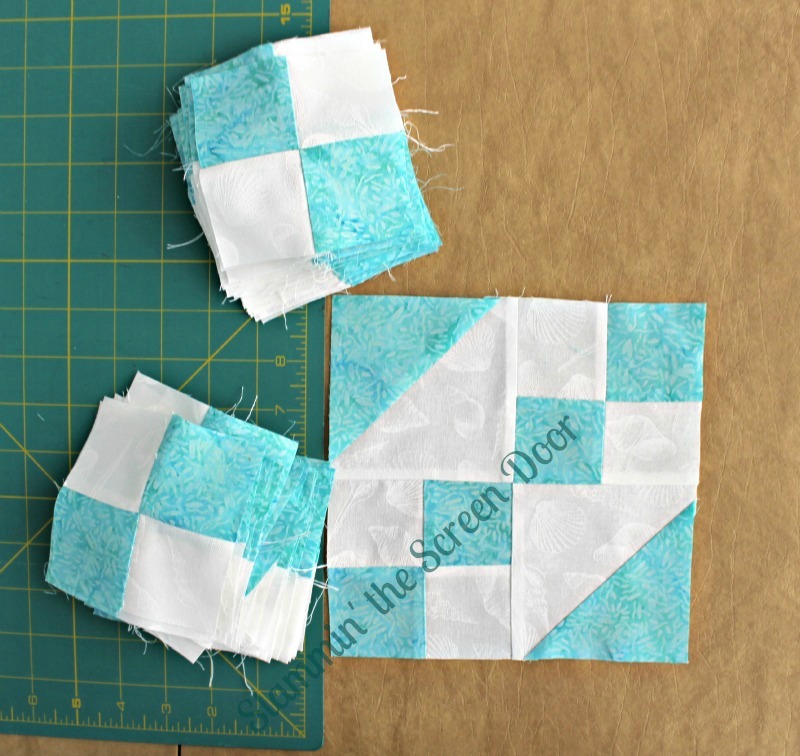 This is, so far, my favorite online quilt shop. Our LQS closed a couple of years ago so I’ve resorted to either online shopping or driving a distance. I love FQS’s customer service and they package everything soooo neatly. Aspen Frost by Basic Grey for Moda. I’m in the cutting stage on this one. Something Borrowed – Operation: Warm & Fuzzy. 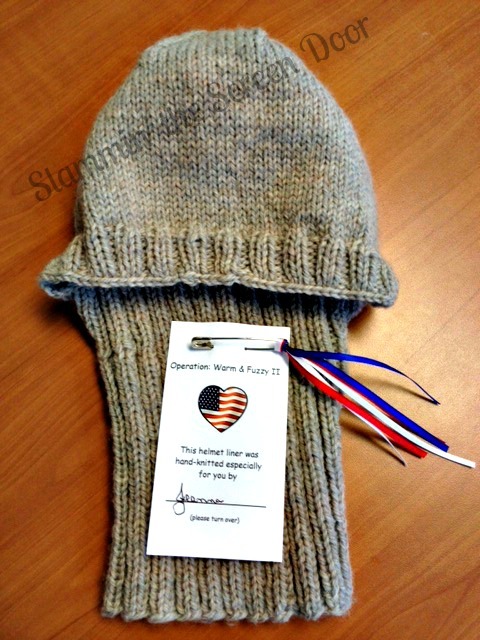 This is a campaign to knit helmet liners for soldiers. The company I work for has a generous community volunteer corps. They donate the yarn and volunteers knit up the liners. In the fall, the liners are donated to The Forgotten Soldiers Outreach, Inc. (FSO) in Lake Worth, FL and they ship them to the soldiers. From our company flyer: FSO sends care packages and letters of encouragement to deployed service members. The goal of this agency is to provide support to the men and women who are fighting abroad, and to inspire hope, strength and courage while they are separated from loved ones, families, and friends. To date, FSO has helped more than 250,000 military personnel serving overseas. Ok, this is a stretch but I am ‘borrowing’ the skein of yarn and ‘returning’ it in the form of a helmet liner. Cheesy, I know. I’ve completed two so far this campaign which started in May. This photo is from Paton, their yarn works up nicely. Something Blue – DD’s graduation quilt. Well, let’s just say there has been more UNsewing than sewing with this project. I realized my quarter inch seam allowance was off, way off. So it’s been a little slow going. I did skip ahead and complete one block to make sure my I had corrected my seam allowance. I hope to make some real progress this week and have a better report to share next Sunday. Now off to celebrate Father’s Day with my DH and DD. Happy Weekend...check back Sunday for my progress report! ...and slam that door a time or two! WOW! Lots and lots of blog lovin’ has come my way since the first post only 3 days ago! I am overwhelmed by Karen’s kind words and Candace’s willingness to display my button on her blog. Due to their generous support I instantly gained many friends. Everyone has given me a warm welcome into blogland. I have discovered so many places to visit for inspiration and I’ve learned so much already! I’ve made new friends from all over the world and even a new one right here where I live. Suzy from Sunshine and Lollipops and I will be getting together for coffee soon! I believe I responded to all of your wonderful comments. For those that were “no reply” , please know that I appreciate you stopping by and giving me words of encouragement. Let’s just say I’m still on a huge learning curve when comes to taking good photos. I’m using my DD’s Canon T2i which is pretty dummy proof (that’s what I need) but I realize there just aren’t good ‘display’ options around here for photographing quilts. That is something I will have to work on. This is my DD’s special someone and he graduated with her a couple of weeks ago. I made him a Senior Year memory quilt and I’ll have to say that I am disappointed in the printable fabric I chose. The package read 100% cotton so I expected it to be softer. It’s colorfast quality is great! In 2010, I surprised my DS with his graduation quilt (below). The pattern is Shoeboxes from Atkinson Designs. And DD knows that Mom would be fair and do the same for her this year. Therefore, I allowed her to choose her pattern and fabric. She chose Butterfly Trails, again from Atkinson Designs. Their patterns are so easy to follow. I have everything cut so it is time to sew! 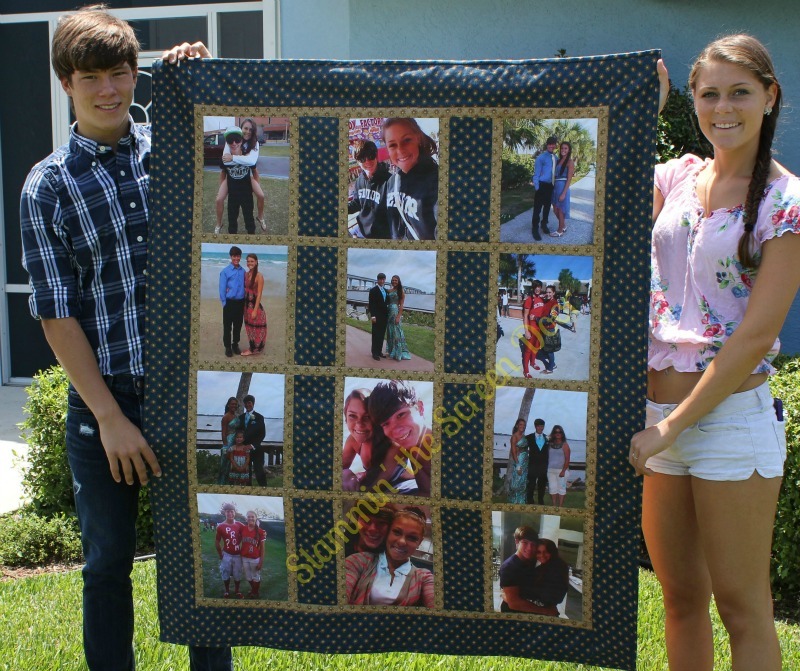 Since the quilt wasn’t her surprise gift, there was no hurry to finish before graduation. I know this is crazy…inserting photos AND ‘linking up’ for the first time in the SAME post, but I did! First, let me welcome and introduce you to my first blog, Slammin’ the Screen Door. I have been a reader and follower of some pretty awesome blogs over the years and will now attempt to come off the sidelines and join the virtual world of sharing. Now for the name… I grew up in south Alabama and my grandparent’s home had a wooden screen door on the back porch. As children - always in a hurry- we ran in and out of that door and never took the time to keep it from slamming. Oddly, my grandmother never corrected us. Over the years, my imaginary screen door has not stopped slamming and this is not a complaint. It is an indicator of how busy life has been (with all good things). As a teenager, I was involved in many school functions and after school activities. As an adult, I have been blessed with a full time job, lots of hobbies and most importantly, I became a wife and mom. My husband and I have two fantastic kids… just ask us J Our son (21) is in the Navy and our daughter (18) just graduated high school in May. This is our first summer without scouts or some sort of travel sport schedule to follow and we will no longer have the many school activities to attend. To keep my screen door slamming, I plan to take this new found freedom and get back to the many hobbies I’ve dabbled in over the years. This includes scrapbooking and reading but mostly I enjoy activities that involve a stitch of some sort like quilting, embroidery, knitting and crocheting. How do you tackle UFOs? Do you work on only one until it is done or do you keep a few going at a time? For her incredible talents as a blog designer and patience with the newbies…Karen @ KarenValentineDesign. You can also find her here. I promise pictures on the next post and it will be a "quilty" one.